Dentist in Waco Make Brushing and Flossing with Braces Easy! You’ll have much to look forward to after your braces come off. With a straighter smile, brushing and flossing will be easier than ever before. However, brushing with brackets and wiring inside your mouth can take some getting used to at first. Luckily, your dentist in Waco knows this all too well. Just because you want straighter teeth doesn’t mean you should experience tooth decay or gum disease in the process. Because of the additional hardware in your mouth, food debris can easily get caught in between brackets and behind the archwire in your braces. This means you’ll have to spend 2-3 times more time brushing your teeth to ensure those extra bits are removed. While this is unfortunate, it’s worth it to reduce your chances of getting gum disease and tooth decay. If you find yourself struggling to remove food with a manual toothbrush, consider an electric toothbrush with a rotating head. This can make those hard to reach areas easier to remove food from and give you time to perfect your technique. Remove any elastics, bands, or other removeable parts associated with your braces. Start by cleaning around you wires and pins. Brush each wire, starting with from top to bottom and making your way around the upper and lower rows of teeth. Provide at least 30 seconds for each quadrant of your mouth. Since you have four main areas to focus on, that should amount to about 2 minutes total. This time may increase depending on your technique and the toothbrush you use. Rinse your mouth and examine your teeth and braces in the mirror, making sure no food particles are caught. When flossing with braces, it’s important to use waxed floss. Unwaxed floss is more likely to tear in your braces’ metal components. Thread the floss under the main wire and move it gently up and down to remove plaque and food from your teeth. Make sure to use enough (around 18 inches is fine) and make sure not to tear the floss while doing so. If you are unsure about your technique, your dentist will confirm if you need to make any changes. While you’re undergoing orthodontic treatment, you’ll likely see your dentist once a month to check the condition of your braces and confirm steady pressure is occurring. Your dentist can also repair broken components and address any cavities or gingivitis you have. On top of brushing after every meal or snack, your dentist may also recommend a fluoride mouthwash to help control plaque buildup in tough-to-reach places of your mouth. Braces may straighten teeth, but they’ll need to be healthy during your orthodontic process. Schedule a follow-up with your dentist in Waco today to ensure you’re on track! Premier Family Dental offers many preventive treatments because they take preventive dental care so seriously. Through routine dental care, you’ll be able to keep any extensive dental procedures to a minimum. Our practice offers everything from cleanings and exams to periodontal therapy and specialized children’s dentistry to help kids in their most vital years of oral development. To learn more about our practice, contact us at (254) 732-0309 or visit our website. 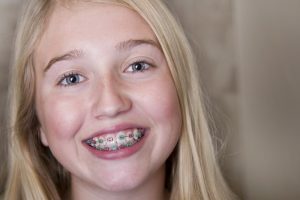 Comments Off on Dentist in Waco Make Brushing and Flossing with Braces Easy!